FEEL THE DIFFERENCE: Our pillowcases have an ultra-soft plush feel that a soft, cool sleeping surface that will make it hard to get out of bed in the morning. The bulk pack is perfect for hotels, physical therapy clinics, schools, and camps. 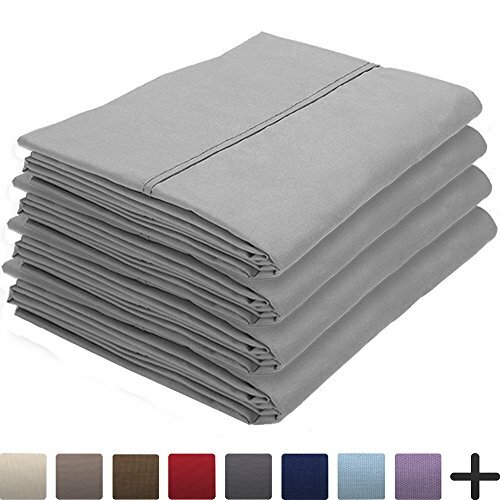 PREMIUM QUALITY & HYPOALLERGENIC: Our Premium 1800 Ultra-Soft Double Brushed Microfiber Pillowcases are skillfully crafted with breathable, double brushed microfiber yarns. The yarns are hypoallergenic and provide resistance against dust mites and other allergens, great for those who are prone to allergies or asthma! EASY CARE & WRINKLE RESISTANT: Machine washable, dries quick on tumble dry low. No ironing required! Our wrinkle resistance technology will give your pillowcases that fresh, new look every time you put them on your pillow!